Northern Ireland striker Peter Thompson has joined Stockport County after Irish League champions Linfield accepted a bid from the League One club. Norwich City had also made an offer but Linfield said it had been unacceptable. The exact fee has not been revealed but it is believed to be a substantial six-figure sum. Thompson, who has seven NI caps and was the Premier League's top scorer last season, has agreed a three-year contract with the Edgeley Park outfit. Thompson netted 44 times last season to help Linfield claim a third successive league and cup double. A statement from Linfield said: "Peter has been an exemplary sportsman and ambassador for this club and his prolific goalscoring record bears favourable comparison with the greats of this club. "Everyone at Linfield extends to Peter every best wish and hopes for success in his future playing career." Linfield manager David Jeffrey had said on Tuesday that he was resigned to losing his top scorer. "It would not be morally right to even think about standing in Peter's way," said Jeffrey. "He has served us fantastically well and was the first to turn full-time. "He made a career decision then and wants to play at the highest level he possibly can and he is in the final year of his contract with us. "It will leave us with a massive hole to try to fill but he goes with our blessing and the club wants to facilitate a smooth passage for him." 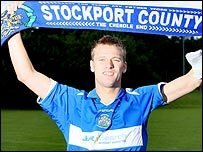 Jeffrey praised Stockport for the way they had handled the negotiations. "They have been professional about it and the fact that their manager and chief executive broke off from a pre-season training trip in Italy to come to Belfast showed their desire for Peter," he added.